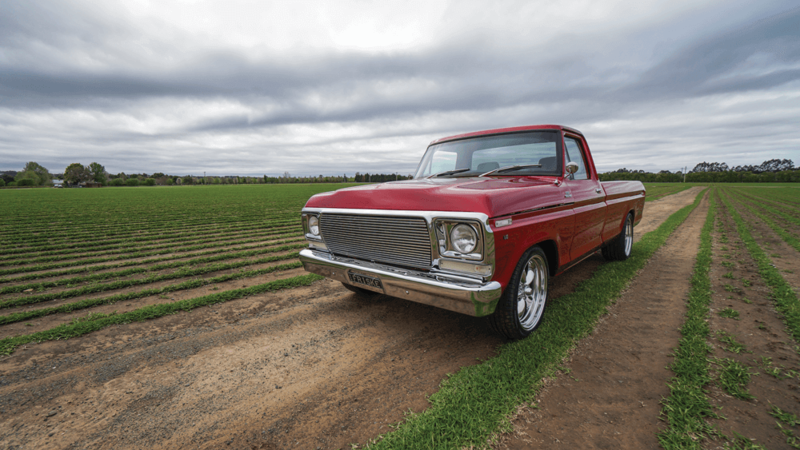 Every lover of classic trucks can appreciate a family connection as many inherited their passion from a previous generation. Friends and family shared with them the tradition and brought them into the community. Many have bonded with their F-100s through childhood memories. Carlo Aracdi of New South Wales, Australia, shares a similar story. In 1978, his parents bought brand new, their Ford F-100 Long Bed. The single cab truck sat three across the bench. His family, however, was made up of his parents and their 6 children. So Carlo and his siblings would sprawl out on a mattress in the bed of the Ford truck. All eight of the Aracdis made many of their best memories in the ’78 Ford. When Carlo’s father passed away, he left him the truck. It had seen more than its fair share of use and work over the years, but Carlo felt a special connection to the truck—or rather, the truck served as a tangible connection to his father. 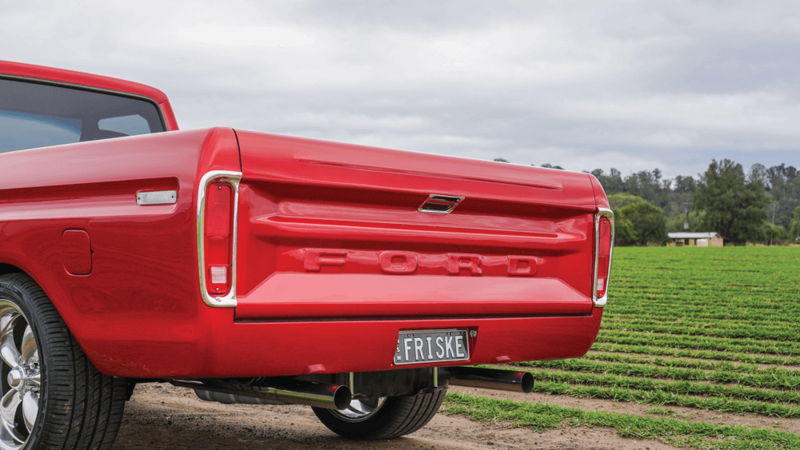 The Ford is a sacrament to his family, and he took the opportunity to rebuild the Ford as a proper tribute, one he could spend every weekend cruising down the highway. Carlo’s gorgeous family truck had been well worn but, by and large, preserved. The frame was in good shape, requiring only minimal repair and clean up. The truck was first completely stripped down. The necessary rust repairs on the frame and cab were completed in a single pass. After the frame had been reinforced, it was protected with a durable gloss black finish. The suspension was likewise refreshed and lowered with DJM Suspension. DJM’s drop beam kit and lowering springs hunker down the truck’s front. DJM drop spring hangers, leaf springs and lowering shocks from Pedders sit out back. 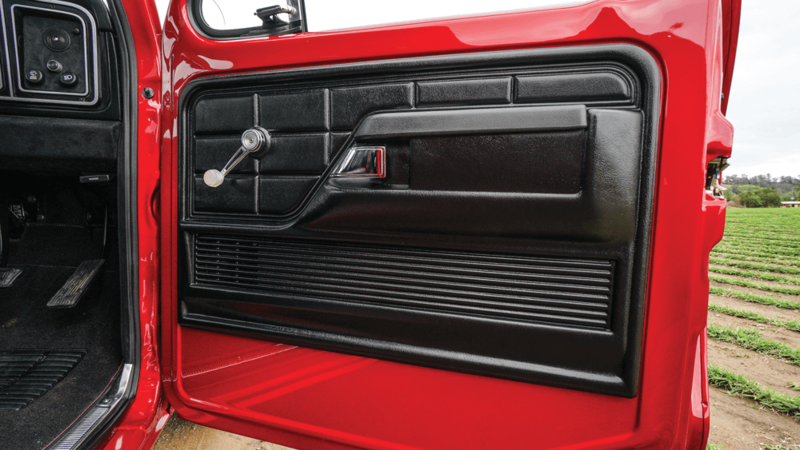 The truck now boasts an aggressive stance that maintains the original visual presence. The modest lowered look works in perfectly with the proportions of the long bed. 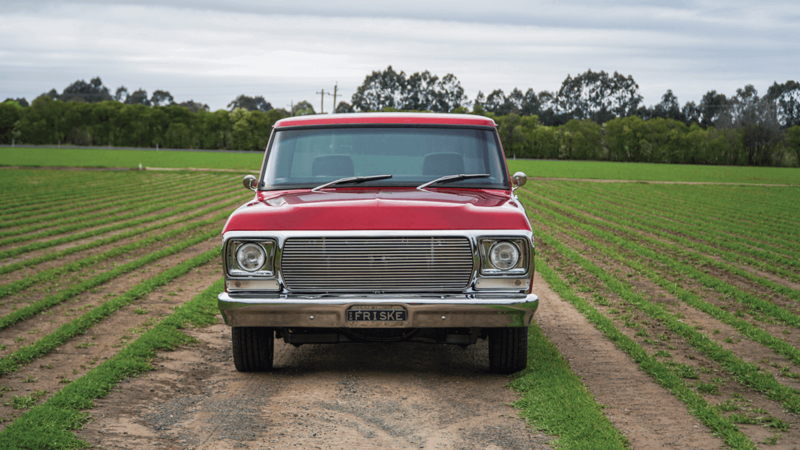 Carlo’s first plan of action when resurrecting his father’s truck was to address to the motor. In 1977, Ford began to apply their newer 351 Cleveland motor to their full lineup of trucks in the United States. In Australia, however, 351C was not used until 1978, when it was only paired with the F-250 and F-350. Ford’s 302C motor continued to power the F-100 series. Carlo, upon rebuilding his Ford, opted for the larger 351C. Local legend BG Engines rebuilt the 5.8L V-8. BG fitted the enginge with alloy heads, an Edelbrock intake and custom stainless headers. The motor is accessorized with a host of badass Aeroflow fittings and billet bracketry. A c6 automatic transmission and 8-inch rear end back the motor. 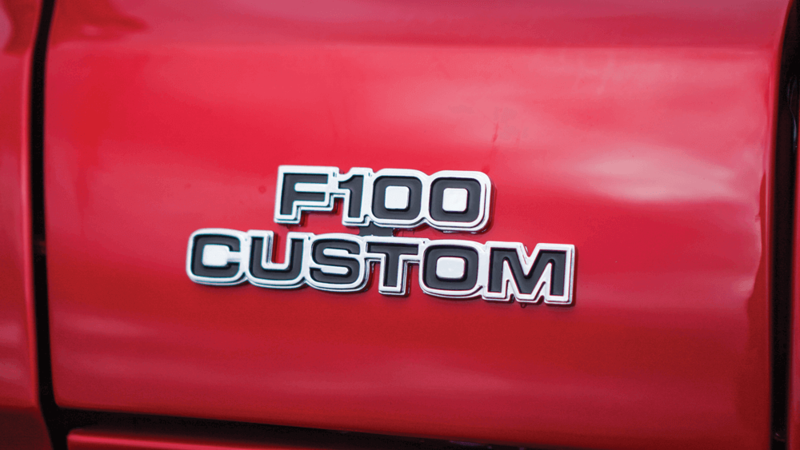 The F-100’s timeless curb appeal is a combined effort involving the stance, paint and choice of wheels. 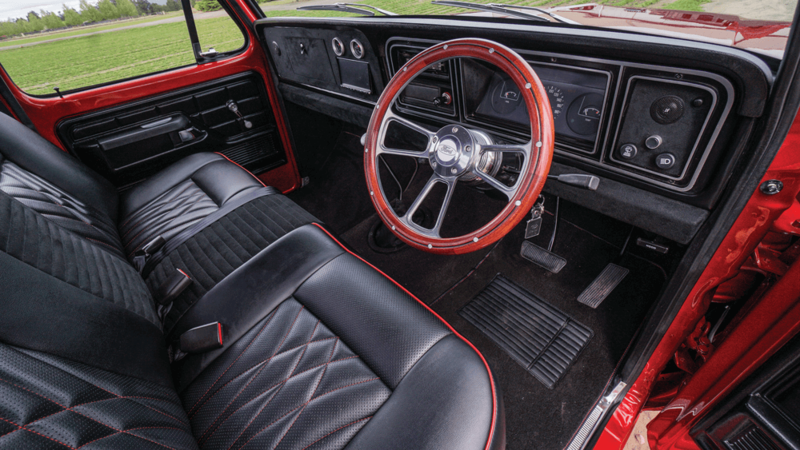 The wheels go the extra mile to tell the truck’s story of passion and custom makings. American Racing Wheels 5-spoke Torq Thrusts sit in a staggered arrangement. In the front, the wheels measure 20×8.5 inches. They are wrapped in Pirelli 245/35/20 tires. The rears are 20×10 inches and use a 275-series tire of the same make. 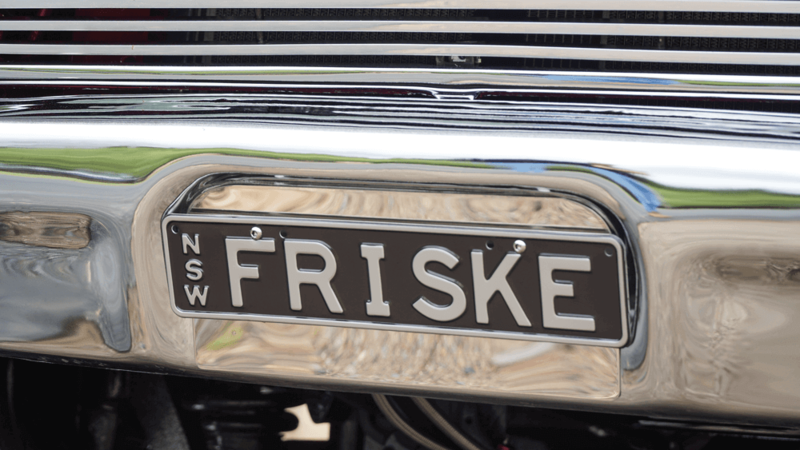 The fully polished finish is unparalleled in its classic look. 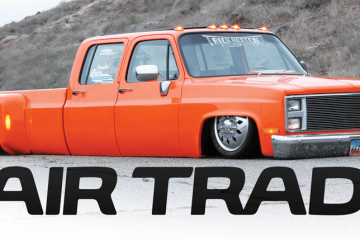 As Carlo’s plan was to maintain the original look and style of his father’s truck, the AR Torq-Thrusts were a perfect choice. There is just something so right about a nice factory restore with a few minor modifications to bring these trucks back to life. Carlo had no intention of altering the exterior elements of his inherited Ford. The ’78 by today’s standards strikes a beautiful balance of classic and modern. The retro-cool vibes are occur naturally and are best left to their own style. To maximize the effect, Carlo did opt to replace several of the body panels. The hood, front fenders, bed-sides and tailgate were all recouped. Originally, the long bed was set to be ditched altogether in favor of a flat-bed. The cab first received extensive metal work and repair. Carlo, thrilled with the results, decided to extend the repairs to the bed as well. With the majority of the body having been replaced, the truck was smoothed and body-worked to perfection. Image Conversion completed the process. They finished the truck with a luxurious coating of Cromax Candy Sol Red. 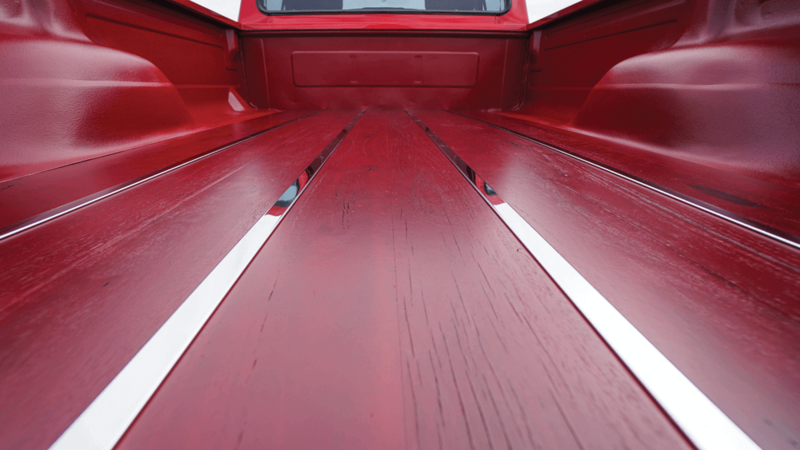 The glimmering crimson helped to establish the whole styling direction of the truck. The repolished chrome bumpers, headlight bezel and custom billet grille insert complete to look. Black never goes out of style. For that reason, Carlo chose an all-black interior overhaul. The stock seats were retrimmed in black leather. Black suede extends over the dash. Fresh black carpet stretches over the floor. With the new-found comfort of the interior, Carlo updated the user experience. The center of the dash now houses a Clarion DVD head unit. The unit sends sound to dual Kicker amplifiers, Kicker 2-way mid speakers and twin Kicker slim line subwoofers. The sound system is more than enough to rattle the cabin. Carlo set out with a simple yet powerful mission: to rebuild his father’s truck and preserve the memories his family had spent a lifetime building. He teamed up with some of the most capable local shops in New South Wales. Together they produced a custom classic. The build preserves the original beauty, accentuates the classic styling and supports its modern use. Carlo’s ’78 is a stunning example of how to keep it simple. Everything from the static stance refreshed 351, polished wheels and stunning paint contribute to the goal. The sum is a perfectly executed plan. Carlo’s truck will serve him for decades to come, as it did his parents, and likely will his children. Next ArticleThe ’90s Chevy Tahoe two-door known as Abduction!